Think of fava greens as fava-flavored spinach, with thicker leaves and a mildly sweet flavor and buttery texture. The leaves are more tender early in the season and can be eaten raw. Later in the season when the leaves are a bit heartier, sautéing or wilting may be the best way to use them. Treat fava greens as you would spinach or pea shoots. Mix them raw into salads or wilt them slightly by tossing them with a warm vinaigrette. Fava greens are an excellent addition to pastas, risottos, salads, and appetizers. Fava greens pair well with fish and seafood. 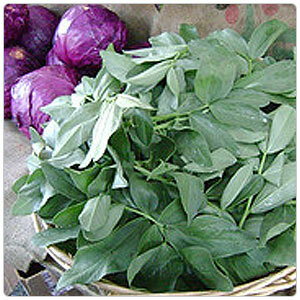 Fava greens are commonly found in Asian dishes, used to wrap fish, shellfish or other seafood before cooking.